John Escobar was credited by The Reading Eagle in 1993 with putting a name to the team's sudden success. The name came as Escobar and teammates looked to take matters into their own hands and end a six-game losing streak, doing so by getting out the clippers and shaving their heads. "Bald power," Escobar told The Eagle after a Reading 8-2 win. "It works." While the move worked for the R-Phils in that June game, it didn't work for Escobar, at least not long term. Escobar was in his sixth professional season that year, having first made AA Reading the previous year. Escobar, though, wouldn't make it higher, his 1993 campaign turning out to be his last. Escobar's career began in 1988, signed by the Phillies as an undrafted free agent out of his native Venezuela. Escobar started that year at rookie Martinsville, getting into 43 games and hitting .216. He moved to short-season Batavia for 1989, getting into 60 games, but hitting just .197. 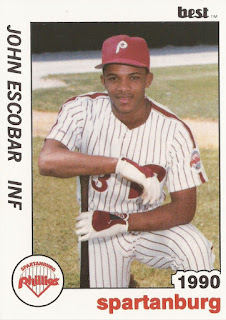 For 1990, Escobar arrived at single-A Spartanburg, increasing his average to .232 and knocking in 31 over 126 contests. Escobar knocked in one of those runs with a mid-April single. In July, he put together a seven-game hitting streak, picking up three hits and an RBI in the seventh game. Escobar moved to high-A Clearwater for 1991, posting the best batting average of his career, .265. He then moved up to AA Reading for 1992, his average dropping to .237. In May 1992, Escobar knocked a bases-loaded double. In July, Escobar picked up an RBI with a bases-loaded walk. Escobar returned to Reading for 1993, but hit just .193 in 65 games, finishing out his professional career short of the majors.